Father’s Day Ideas from Schnee’s! Father’s Day is just around the corner. This year, surprise dad with a gift that he sure to love and enjoy from Schnee’s! Schnee’s has a wonderful assortment of gift items that are sure to please any dad, even the “hard to shop for” dad or for the dad that has everything. 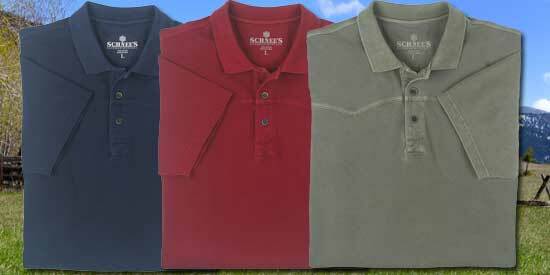 New for 2011, the Schnee’s Powder Horn Polo will keep dad looking good and feeling great in the office, on the town or on the links! Crafted from Grade-A 100% Cotton Pique fabric, this incredibly comfortable polo features subtle western accents for a distinctive look. Available in either long or short sleeves in burgundy, olive and navy colors. Quality leather products are something that every man can appreciate. From the unique hand and feel of the leather to the beauty of expert craftsmanship, there is just something about quality leather goods that leaves a lasting impression. Schnee’s is proud to offer an exclusive assortment of Genuine American Bison wallets and accessories that are sure to please any dad! From Schnee’s classic 9 Pocket Bison Wallet to the extremely popular Dresser Caddy, get dad something that he will use and cherish for years to come! To see other great gift ideas as well as all of the other great products that Schnee’s has to offer, visit us online at www.schnees.com today! If you have questions regarding any of our Schnee’s products, would like to request a free Schnee’s Catalog or would like to talk to one of our expert Customer Service Representative, please give us a call at 1-800-922-1562!